Vogue Germany is following in Porter’s footsteps and giving us an issue dedicated to #WhatMatters. 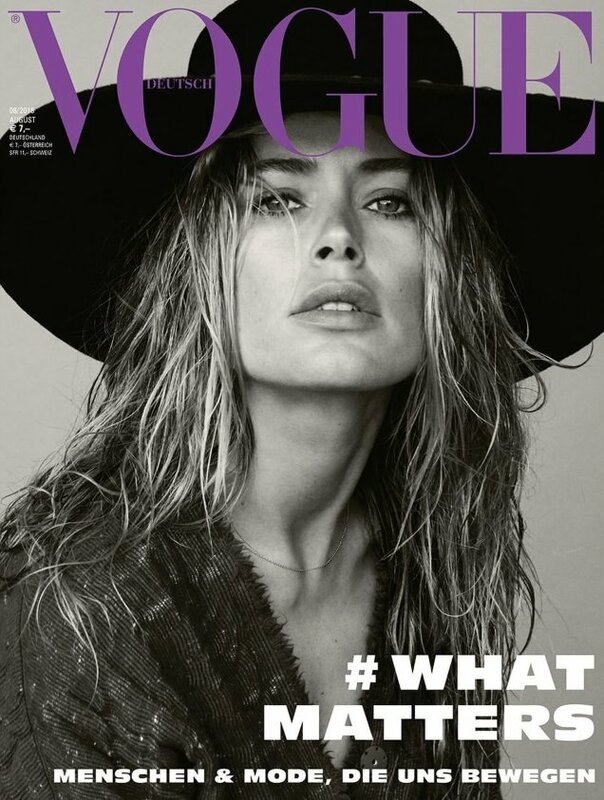 Dialing down the va va voom from last month’s high-octane trio of covers, German Vogue once again offers multiple choice at the newsstand, serving up four unique covers for August 2018 featuring Doutzen Kroes, Naomi Campbell, Edie Campbell and Anja Rubik. Photographed by Daniel Jackson, each model brings awareness to a different cause and stars in simple, effortless covers styled by Christiane Arp and Nicola Knels. It’s obvious that certain covers would stand out from the rest, right? Our forum members were quick to weigh in with their favorites. “Edie’s cover is the best so far, but the purple masthead is horrible,” confessed sixtdaily. “Flashes of Twiggy with that Edie cover, she looks spectacular. Definitely the strongest of all four and the only one worth mentioning. Will get it purely for the cover,” Benn98 raved. “In love with Edie’s cover. I’m not even a big fan of her but she has been proving me wrong: Vogue Paris June/July first and now this cover. She looks fantastic and I love the Twiggy vibes,” echoed forum member apple. “Anja’s is the most intriguing to me, but they’re all gorgeous covers,” added orchidee. “Anja’s cover is my favorite; she has the perfect profile to pull off this kind of shot,” 333101 said. Not every cover was well received, however. “I feel like we have seen Naomi’s cover a dozen times. She is always styled the same way. It takes the excitement away from her new work,” said LustforFashion. Les_Sucettes felt the same way. “Naomi’s is totally nondescript, could have been an image for any of those numerous magazines that use stock images as cover,” she said. Which cover will you be hunting down, if any? Check out Daniel Jackon’s accompanying cover shoot and join the conversation here.